Re-Kaged anabolic protein fuel is a health conscious cutting edge protein powder made by Kris Gethin’s own Kaged Nutrition. This protein is made from non-GMO whey protein isolate and contains approximately 28 grams of protein per serving along with 1.5 grams of betaine, 1.5 grams of creatine HCL, and 3 grams of fermented glutamine. From the start, this formulation is already strong. But, there are still a few characteristics that make it better. For starters, Re-Kaged contains the digestive enzyme blend known as Prohydrolase. Prohydrolase is the patented enzyme blend made by Deerland Enzymes and under clinical studies has been found to increase the usability of protein supplements in the body. This is achieved by breaking large protein chains into smaller, more manageable protein chains within the optimal time frame for digestion and absorption. In Deerland Enzymes own clinical studies, Prohydrolase has been found to be more effective at doing this than their top competitors. The benefits of Prohydrolase’s activity ranges from better anabolic response to less stomach irritation/bloating after protein supplementation. Not a bad addition at all. Another beneficial characteristic to Re-Kaged protein that many others cannot match is a total absence of artificial flavors, colors, and additives. A problem that has plagued, and still plagues the entire bodybuilding market. In Re-Kaged, you will find natural coloring alternatives like beet root, natural sweetening alternatives like stevia, and zero soy lecithin. This may not sound like a big deal, but it is. After all, you’re drinking a protein shake to avoid all the garbage out in the world, why would you want to let some slip by and bog you down? As a whole, Re-Kaged is a pleasure to take – as long as you like fruit flavored protein powders. Re-Kaged currently only comes in the flavor strawberry-lemonade; it is thin and refreshing, but for the chocolate or vanilla die-hards it may not be a good fit. Serving up at 28 grams of protein per scoup, Re-Kaged comes in at that happy medium between 20 and 40 grams of protein. This is the ideal amount to take immediately post workout, and in our experience it has really worked well. In general, with Re-Kaged and any other protein supplement, you are going to want to eat a solid meal as soon as possible when supplementing in the post workout window. This will allow you to get the most out of your efforts in the gym. While taking Re-Kaged protein, we could really notice the presence of Prohydrolase. Thanks to this enzyme blend, there wasn’t even the slightest hint of stomach upset. Additionally, digestion as a whole was on point, which is absolutely necessary while building up some muscle mass. 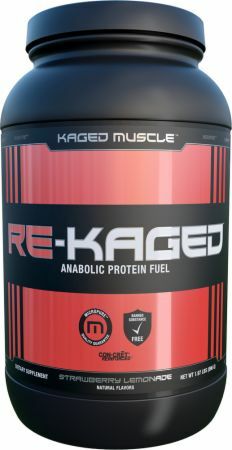 In a nutshell, Re-Kaged is an upper echelon protein powder. Its non-GMO sourced, without artificial additives, and supplies a worthy 28 grams of protein per scoop. It’s absolutely solid. However, it’s not the only brand that does this. And, it’s pricing in at about $2 per serving which is an upper echelon price that not everyone is willing to choose to pay. But, if you have the money – Re-Kaged is worth it. For a general comparison, consider everything we’ve mentioned here in this article, and compare it to the supplements we have laid out in our best protein powders article. Re-Kaged is a popular and high quality whey protein, however, many other quality proteins also exist now days. Due to this, the premium price per only 20 servings is beginning to come with a burn on our wallets. In Gethin’s favor, is that this is one of the only whey proteins that contain both Prohydrolase and added betaine/creatine. That’s a decent plus and will be an appreciated perk. However, $40 for a mere 20 servings of non-grass fed whey isolate is tough to legitimize these days. Especially when this appears to be a bodybuilding owned brand. Meaning, it should be more affordable.